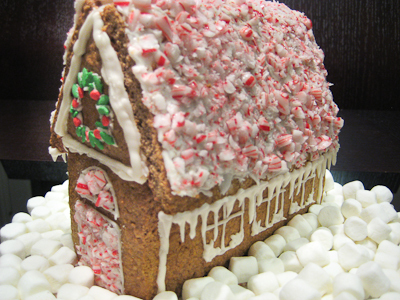 The gingerbread was simple enough to make - just a few minutes to prep and then two hours to chill in the refrigerator. A few bakers noted that their dough was too dry, but I had no such issues with mine. The more time consuming aspect was (obviously) the assembly and decoration of the gingerbread house. I wish I could have made mine more elaborate, but with only short spurts of time available to me today, I had to go simple. I made a half recipe of gingerbread and a full recipe of royal icing and that seemed to be just right for my little house. Thanks Anna and Y, for hosting this month's challenge. 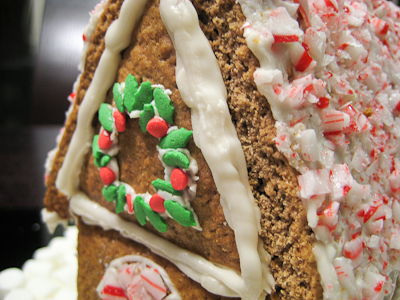 It was fun making my very first gingerbread house. 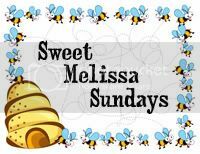 Make sure you check out the Daring Bakers' Blogroll to see all the other wonderful creations. 1. In a large bowl, cream the butter and sugar until blended. Add the cinnamon, ginger and cloves. Mix the baking soda with the boiling water and add to the dough along with the flour. Mix to make a stiff dough. (*Make sure you don't overmix the dough initially as you'll over develop the gluten and make your dough tough and shrinky.) If necessary add more water, a tablespoon at a time. Chill 2 hours or overnight. Beat all ingredients until smooth, adding the powdered sugar gradually to get the desired consistency (I used about 2.5 cups of powdered sugar). Pipe on pieces and allow to dry before assembling. If you aren't using it all at once you can keep it in a small bowl, loosely covered with a damp towel for a few hours until ready to use. You may have to beat it slightly to get it an even consistency if the top sets up a bit. Piped on the house, this will set up hard over time. I'm glad you baked when your baby slept, ahahah! Your house is quite adorable! I like the peppermint roof! i really like your icicles! That's really cute! 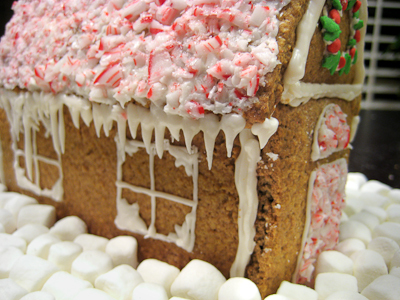 I like the crushed candy on the roof and the marshmallow snow! I'm glad you were able to bake when your baby slept - so cute! How fun to have a new baby at Christmas time! Have a wonderful new year! Your house is amazing! I love the icicles the most. Good work! I'm hoping to try this one next year. Ooh, I can almost smell all that peppermint just looking at the pictures! And I wish snow was really made of marshmallows - I'd want to go out in it all the time! Unless it was melting...sticky icky. Your house is really cute, great job! 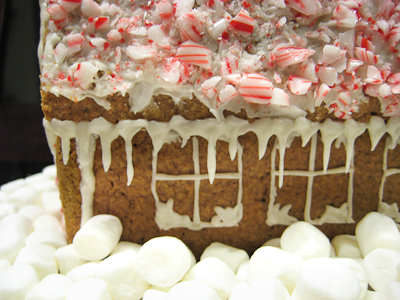 I love the crushed peppermint roof...what a fun idea! And the icicles are just perfect! Great job! I love the peppermint roof. Your house is beautiful. Can I move in??? Everything is so creative. Great, don't I feel like a loser. With a newborn baby and all the holiday "stuff" going on you still manage to make a gingerbread house AND blog about it. This month I barely remember my name and where's my oven? :) Great job, Jaime! Your house is just fantastic! Happy New Year!